The first quarter of 2019 has brought a number of important legal updates pertaining to cryptocurrency taxation. Some countries, which had been cautious for a long time, have finally defined the tax treatment for virtual assets. Other states have introduced measures to ensure the transparency of crypto taxation. 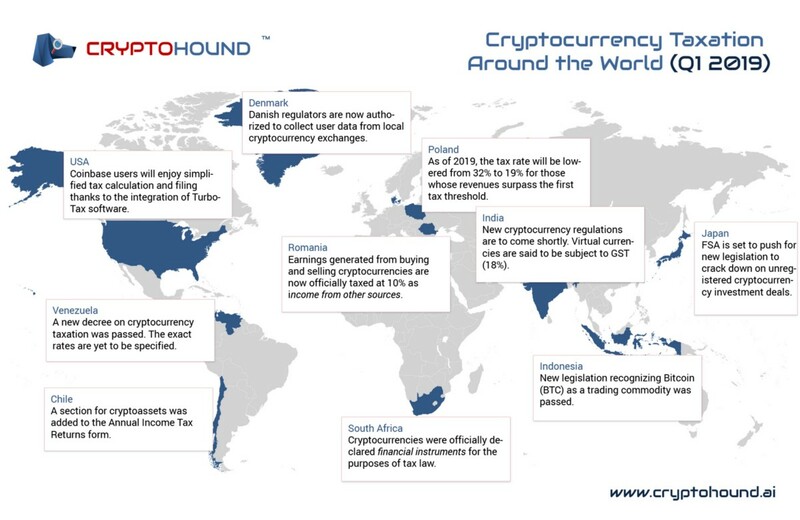 Below, you will find a brief overview of the 10 most important updates in cryptocurrency taxation from all over the world. Just ahead of the tax-reporting period, the Internal Revenue Service of Chile has added a section for virtual assets to the Annual Income Tax Returns form. Cryptocurrencies are seen as intangible assets, thus being exempt from VAT. Chilean citizens will have to declare their crypto income as other own income and/or third-party income from companies that declare their effective income. The Internet community believes that the tax rate will stand at 35%, which is similar to other sources of personal income. Tax return filing will be automated for Coinbase users from the United States. The exchange has integrated TurboTax, an external tool that automates calculating and filing taxes for crypto assets. The software will be able to process up to 100 transactions per time. There will be no need to file taxes if virtual assets are derived from a fork or an airdrop, or if they are converted to fiat money or used for shopping. The government of Venezuela has published two decrees concerning cryptocurrency taxation during times of economic emergency. According to the new regulations, everyone dealing with virtual currencies or foreign fiat money will have to report it on their income taxes. Only security traders on the Caracas Stock Exchange and export professionals from the public sector are exempt from the above provisions. Danish regulators have taken a hard stance on cryptocurrency traders. From now on, all local crypto exchanges have to disclose user data such as names, addresses, trading volume, and CPR. Once given access to all personal details, the tax authorities will calculate the total tax due for 2016–2018 and reach out to those who failed to pay it in full. According to the new crypto regulations in Poland, cryptocurrency traders will have to declare earnings from selling virtual assets. The tax treatment will be similar to that of stock market revenues, but with rates that are more attractive; revenues exceeding the first threshold (an equivalent of $22,000) are taxed at 19%, not 32%. Cryptocurrency taxation is now official in Romania. Following recent amendments to the tax laws, gains from buying and selling Bitcoin will be taxed at 10% as income from other sources. Low-income investors will be exempt from taxation. In particular, there is no need to declare taxes if gains from a single transaction are below $50, or if the total annual earnings are below $150. The President of South Africa has enacted the Taxation Laws Amendment Act, which defines virtual currencies as financial instruments for the purposes of tax law, and they will be taxing them based on the price obtained in an arms-length transaction on the open market. The new regime also provides ring-fences losses from trading crypto assets. India is about to pass new cryptocurrency regulations. This will potentially bring more clarity to the sector and ease the de-facto ban on crypto trade imposed by the Reserve Bank of India. According to local tax experts, virtual currencies may be taxed as capital gains (similar to other investable assets), ordinary business income (in the case of active traders), or as commodities (subject to an18% tax). The Commodity Futures Trading Regulatory Agency of Indonesia has reportedly approved a new regulation recognizing cryptocurrencies as trading commodities. This means that any trade involving digital assets will be taxed similar to gold or other precious metals. More specifically, this will incur a tax rate of 0% to 30% for individuals and 25% for businesses. If the annual income from crypto trade is below $3,800, the individual does not need to pay any tax; if it exceeds $35,200, however, the highest tax rate of 30% will apply. Having detected a loophole worth $74 million of unpaid taxes and fines, Japan’s Financial Services Agency is set to push for new legislation to crack down on unregistered cryptocurrency investment deals. The amendments will regard the Financial Instruments and Exchange Act, which does not prohibit unregistered companies from collecting investment funds in cryptocurrency, leaving them unpunished in cases of tax evasion. The US, Denmark, and Japan, being among the more mature crypto adopters, are working on closing all potential tax loopholes and setting in place the processes for ensuring tax compliance (e.g. by accessing user data and automating tax filing). Poland and Romania are seeking to improve their investment attractiveness by offering low tax rates for cryptocurrency traders (19% and 10%, respectively). Venezuela, Indonesia, and South Africa have officially recognized the status and tax treatment of virtual assets. India and Chile, while being secretive about their future plans, were spotted preparing new regulations with regard to cryptocurrency taxation. Willing to get more crypto insights?